A GROUP OF lay Catholics has called on the organisers of the World Meeting of Families to rescind an invitation to pro-LGBT cleric James Martin. Martin, who is from the US, has long advocated the benefits of having LGBT people in the church. A letter has been sent to Dublin Archbishop Diarmuid Martin, asking him to stop the cleric from speaking at the event. The Irish branch of the Tradition, Family, Property (TFP) has been gathering signatures to voice its disapproval. The event takes place from 21 to 26 August. Pope Francis will visit for the final two days of the meeting, which is held every three years. The letter to the Archbishop reads: “The hosting by your Archdiocese of the World Meeting of Families should be a joyful occasion for Ireland. The choice of Dublin as venue by Pope Francis should serve as a consolation for Ireland at a difficult time and is of course the effective reason for the Pope’s pastoral visit. At time of publication, over 9,500 people had signed the letter. Talking to America Magazine last month on the topic of LGBT inclusion, Fr Martin said: “Why wouldn’t we want to help baptised Catholics feel included in their own church? And the argument that they’re sinful is beside the point because we’re all sinful. 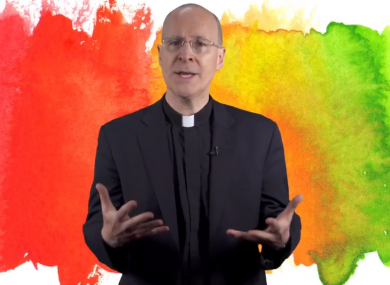 “I’m tremendously grateful for this invitation, not so much for what it says about my own ministry or writing but what it says to LGBT Catholics, a group of people who have for so long felt excluded. I hope they see this invitation, which had to be approved by the Vatican, as an unmistakable sign of welcome from the church. Last month, We Are Church Ireland, a group which campaigns for the equal inclusion of women and LGBT people in the Catholic church, described how it was being ‘ignored and discriminated against’ in its applicationto be part of the event. We Are Church Ireland said it applied back in February to have a stand in the RDS, and even paid a deposit, but did not receive a written response. Email “Nearly 10,000 sign petition calling on pro-LGBT priest to to be disinvited from Dublin papal event”. Feedback on “Nearly 10,000 sign petition calling on pro-LGBT priest to to be disinvited from Dublin papal event”.